The first picture is of Holly when she was 4 months old. The bottom picture is of Josie at four months, just a week or so ago. I know they don't look exactly alike, but the similarity is definitely there! And they both look thrilled to be in cloth diapers, don't you think? 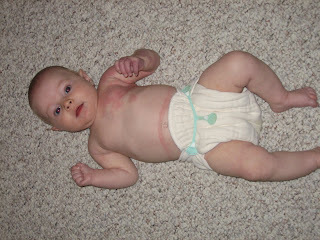 I am completely frightened by the crazy cloth diaper Holly has on! Josie just looks tolerant of hers!